The Springstowne Wildcat Wrestling Team has won many accolades on the wrestling mat , yet has refused to stop there. Their goal is to bring positive light to the campus at Hogan Middle School, which extends into the community of Vallejo, throughout the State of California, all across the United States and even on a far reaching global scale...Take a look at some of their activities which have taken place here at home and abroad!!! In April of 2018 four Springstowne Academy Wrestlers traveled to St. John' Catholic School in Napa to inspire with our "Wrestling For Fun" Clinic series. Jan Marcy Soy, Ashton Balassu, Cherie Luu and Alina Pham facilitated wrestling drills to four classes of 5th-8th graders over the course of two days. It was a great mentorship opportunity for our kids and the St. Johns Principal was pleased with the outcome of the event. "Thank you so much! The students loved it! ... We had some 8th grade girls who want to wrestle at their high schools now and so I think it was a great experience for them." - Principal Olivia Brazil. During Black History Month a number of Wildcat Wrestlers set out to honor Civil Rights icon Jackie Robinson while also honoring pioneering wrestlers who helped pave the way here in the United States as well as the community of Vallejo. The poster board project was presented to HMS Principal Hines with presentations from our current Wildcats explaining the amazing wrestling careers of icons such as Kenny Monday, Kevin Jackson, Jordan Burroguhs, Randi Miller and Toccarra Montgomery. Springstowne Wrestling Alum and current Jesse Bethel High School Coach also gave insight to the rich history of our own black community's contribution to the sport! During our 2014 trip to Maryland for the Wrestle4Hope All-American Girls Classic our Lady Wildcats paid a visit to the Vietnam Memorial Wall in Washington D.C.
Our Lady Wildcats and staff made rubbings of Vallejo's 28 Service Members who gave the ultimate sacrifice during the Vietnam War. On June 9th of 2015 the framed rubbings were presented to our Mayor Osby Davis and the City of Vallejo at Vallejo City Hall. 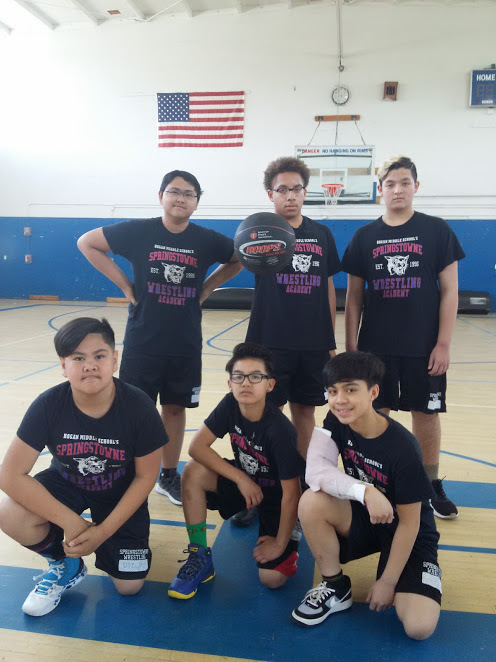 In April of 2015, six Academy Wrestlers competed in the Inaugural Hogan Middle School Hoops For Heart Basketball Tournament . Our "Wildcat Wrestlers" played hard losing their only game to the eventual champion "Rockets." They pulled to 15-13 at the half before losing to the much larger Rocket squad 29-15. 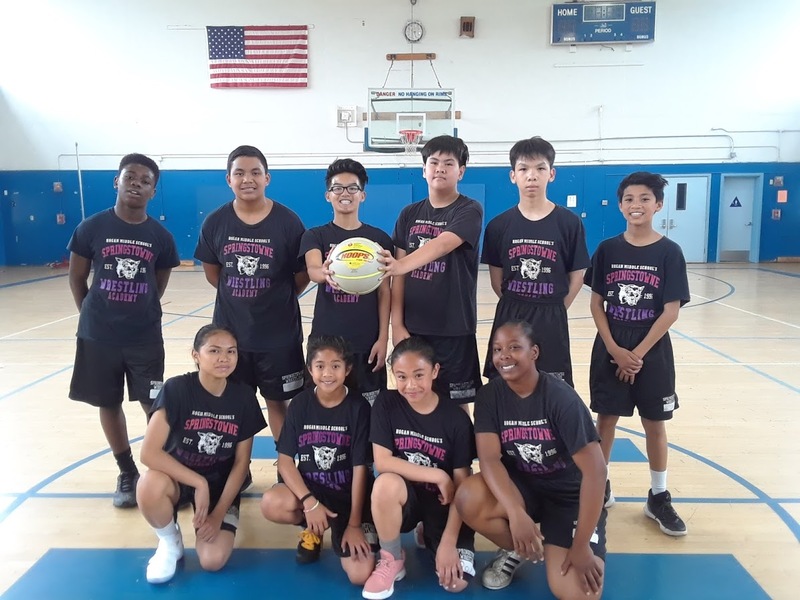 The efforts of Adonis Batts, Elijah Batts, Mark Ryan Jimenez-Diolanto, CJ Fernandez, Diego Barba and Mikey Reagan drew the largest cheers from the crowd on the day and many compliments on their heart from school faculty. They played hard and most importantly were part of a larger cause in which $800 was raised for the American Heart Association and inspired more Wildcats to hit the hardwood!!! We teamed with Vallejo's Team Tennessee, Springstowne's Wildcat Wrestlers did their part to promote anti-drug awareness and the importance of community as they did beautification cleanup and tied red ribbons along their 2.5 mile stretch of Tennessee Street in October of 2008!!! Since 2011 our cleanup encompasses our new Hogan campus and the bordering streets of Rosewood and Georgia. In 2008 the Wildcats banded together to collect 45 pounds of Christmas goodies and a number of cards for care packages to send to our brave troops stationed in Afghanistan and Iraq through American Canyon Troop Support!!! Our 2017 Troop Support drive culminated November 3, 2017 with 55 lbs of goods. Previous totals were 2009's 51 lb total, 2010's 71 lbs, 2012's 30 lbs, 2012's 72 lbs, 2013's 32 lbs, 2014's 76 lbs, 2015's 95 lbs(All-Time High) and 2016's 60 bs. ...to promote wrestling in the Philippines by showcasing the Fil-Am talent we have here in the United States. Through modern technology via Youtube, we hope to inspire the growth of wrestling in the Philippines as well as allow the Wrestling Association of the Philippines our scout our talent. -To provide humanitarian and development assistance to areas in Vietnam. -To promote communication, education and cultural exchanges that reflect the best qualities of both cultures. -To create an environment brightened by hope and sustained by peace. To See The Pictures Of The Building And Dedication Ceremony Of Hoang Van Thu!!! 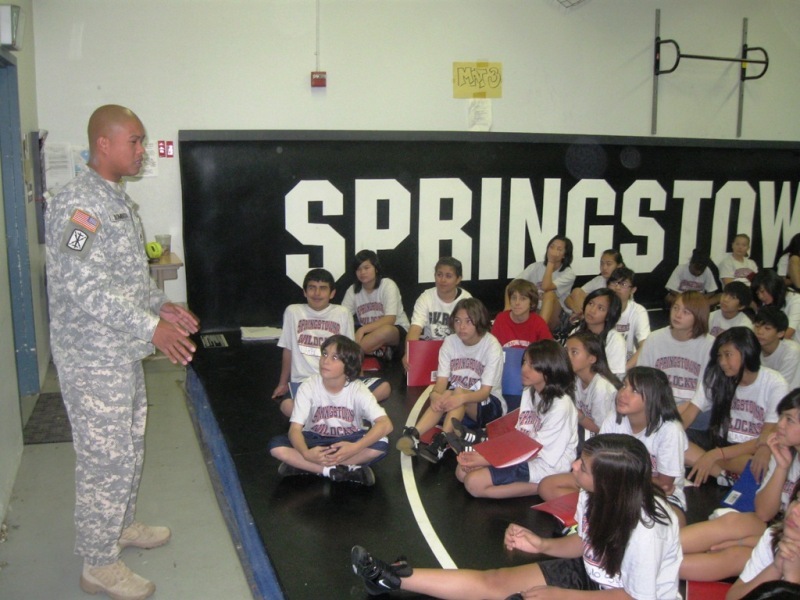 The Springstowne Wildcats and The Vallejo PAL joined forces to Inaugurate the Vallejo PAL Fall Wrestling Classic in the Fall of 2008 to help fund and promote the growth of wrestling at the grassroots level in Vallejo!!! The two organizations co-hosted six Fall Classics between 2008 and 2013. Over the course of three weeks in October of 2012, a handful of Wildcat wrestlers traveled to Napa to assist Silverado Middle School, who was establishing a new program. The Silverado Dons were coached by James Guiducci, who is the brother of our coach Jason Guiducci. Our Wildcats encouraged the program's new wrestlers by educating them about the sport through teaching technique and wrestling drills. From 2005-2009 the Lady Wildcats raised over $3,000 and walked 25 kilometers at Walk For Hope in their quest to takedown breast cancer!!! Please click the picture if you'd like to learn more about Walk 4 Hope!!! The Springstowne Wildcats hosted the Japan National Exchange Team in Vallejo, where they were warmly received as guests by our community and led on local tours by our wrestling staff. On the mat they shined in a friendly exchange dual meet with a local all-star team comprised of wrestlers from Hogan, Bethel, St. Pat's and Marin Catholic. The group was taken by Vallejo's vibrant and diverse community. Coach Kenji Koshiba said, "When our kids return to the United States, they would like to come back to Vallejo. Great Job Wildcats!!! For our 9/11 Day Of Service, we collected $450 for Pennies For Peace. The event is designed to heal the wounds of September 11th by creating a positive relationship and supporting education in Afghanistan and Pakistan through the Central Asia Institute featured in the book Three Cups of Tea!!! 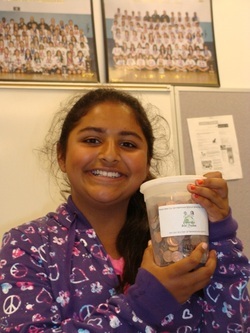 Lady Wildcat Harneet Sandhu donated her empty jar and the Wildcats have collected an additional $72 by simply picking up any stray coins they may come across. The Springstowne Wildcats converged on Vallejo City Park, which is the oldest City Park on the West Coast dating back to 1868. The team offered up it's services and lent a hand prepping materials, digging postholes, placing posts and mass clean-up just to name a few. Our team was part of what the Vallejo Times-Herald stated was "...the beginning phase of a plan for Vallejo residents to retake historic City Park with a five-day construction of a playground complex." To See The Vallejo Times Herald Audio Show About The Event!! !